Pens made from a variety of woods - Great Gifts for your customers! 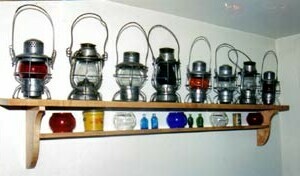 This customer collects old railroad lamps. The shelf tilts out just 7 degrees to hold the lamps away from the wall so they display better, and has a raised edge which keeps them from sliding off. 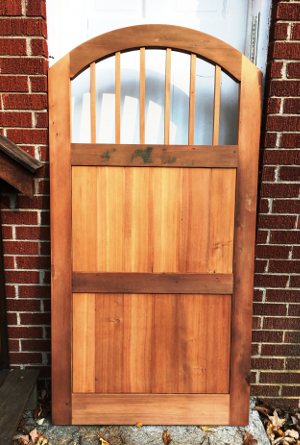 This was built from an old plan in my early days of woodworking. It was made out of Chestnut, found in my father's barn, and has a mechanical movement with "on the hour" strike mechanism. It has kept good time in our homes in Western Mass., Upstate New York, an now in our home in Western North Carolina. It has a constant soothing "tick-tock" sound and still strikes every hour on the hour. 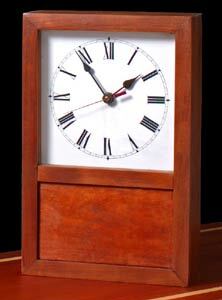 This clock was my own design and built for my Mother-In Law, who wanted a shelf clock for a particular spot their new home in Florida. She made a needle point scene for the lower rectangle on the front. 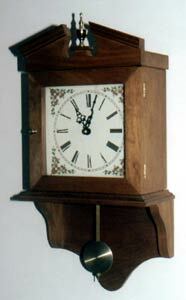 It is made of natural cherry, and has a battery operated quartz movement. This was made as a wedding gift for one of my neices. I had been saving the delicate face for something "special". 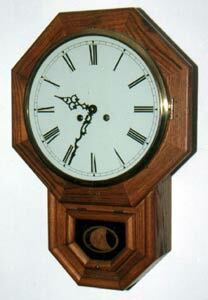 The design came from an old plan, the wood is cherry, and the movement is quartz.